Iwaidja, Ilgar and Maung are Iwaidjan languages from Northern Territory, Australia. It is suggested that Iwaidjan languages be grouped together with other languages in the Arnhem Land language family. Iwaidja and Maung are highly endangered languages spoken by only around 200 people each. The last speaker of Ilgar died in September 2003. In Ilgar, the same word – aɲjagbamiɲ – can mean both ‘my son’s daughter’ (when it is a man speaking) and ‘my brother’s son’s daughter’ (if the speaker is female). For speakers of most European languages it might seem strange that ‘one’s brother’s son’s daughter’ is a significant concept of its own, let alone the fact that it is expressed with just one word. Words that describe the world around us may differ considerably across languages depending on the way speakers of different languages view the world. Learn more about this fascinating phenomenon in the Book of Knowledge (Chapter 2). Go to the Interactive Map, find Iwaidjan languages there and try to figure out how Iwaidja expresses the concept ‘mother’. You can also browse the DoBeS Archive for more recordings and samples of the Iwaidja language. 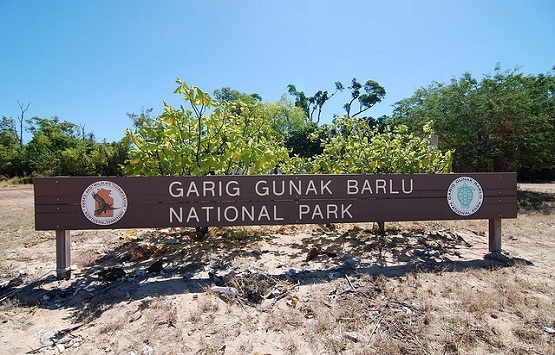 Sign “Garig Gunak Barlu National Park”. With three words in Iwaidja: Garig (a local language name), Gunak ‘land’, Barlu ‘deep water, the blue sea’.